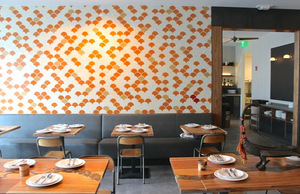 The dining room at Burma Love on Valencia. Photo: Dana Eastland. © tablehopper.com. The bar area. Photo: Dana Eastland. © tablehopper.com. The bar. Photo: Dana Eastland. © tablehopper.com. A report by Dana Eastland. Update: we received more information from the folks behind Burma Superstar, and it ends up we weren’t given all the information. This project is actually called ~BURMA LOVE~ and, while it is the same owners as Burma Superstar, the concepts are different. It has been almost three years since we first reported on ~BURMA SUPERSTAR~ coming to Valencia Street, and after numerous check-ins with the staff (and Karl Hasz for construction updates! ), we’re happy to say the opening will be just after Christmas. This is the fourth location for the local chain, joining the original on Clement Street, in addition to outposts in Oakland and Alameda. 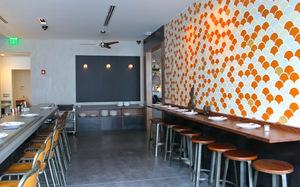 The space is polished and comfortable, with a wall of warm-hued scallop tile in the dining room and bar. The scallop motif is repeated in a metal open-work wall against the back wall that separates the kitchen from the dining area without completely closing it off. The tables and chairs are made of warm, smooth wood, while the banquettes are a cool gray leather and the floor is a gray poured concrete. There are some Burmese antiques and objects throughout the space, as well. 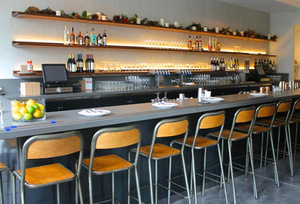 The menu doesn’t differ from their other locations, but there is the exciting addition of a full liquor license and therefore a cocktail menu. Cocktails are all priced at $10 and are not overly complicated. Check out the Green Point (rye, sweet vermouth, yellow Chartreuse, and Angostura and orange bitters) or the Momo (tequila, lime, fresh tamarind juice, and Cointreau). There is a separate bar area off to one side, which is certainly welcome given the restaurant’s popularity and famously long wait times. They’ve begun with some friends and family dinners this week while the kitchen ramps up for an opening planned just after Christmas. Some finishing touches are still being added to the space, as well. When they do open, hours will be 5pm-11pm daily, and lunch will be added in a few months. We’ll let you know! 211 Valencia St. at Duboce. The interior of Hogwash. Photo by Michael David Rose Photography courtesy UrbanDaddy. 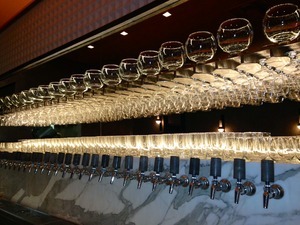 The impressive taps at Hogwash. Photo courtesy Hogwash. A report by Dana Eastland. ~HOGWASH~, a new beer hall downtown, became the latest place for suds when it opened on Saturday December 13th. As we first mentioned in September, this beer bar comes from owners Nick Rothman and Paula Thompson, and offers a major selection of beers on tap (Rich Higgins assembled the list). There are 30 in all, from far and wide, including Hitachino White Ale (Japan), Fuller’s London Porter (London, believe it or not), and Monk’s Café Sour (Belgium). There are also lots of domestic taps on offer, including locals like Almanac, Lagunitas, and Magnolia. Here’s the whole list, with a handy glassware guide, too. The beer selection will change often, but the goal is to make sure that it is well rounded and that there is something for everyone, from the intense beer nerd to the casual sipper. Thompson emphasized that they are focused on hospitality and welcoming everyone, because really, beer is all about socializing, right? The space was designed by Lauren Geremia of Geremia Design and has a modern, sleek feel, with warm touches. Eater snapped some great pictures last week, if you’d like to see a slideshow. There is a lot of oak and steel, as well as some warm brick touches and mod white paneling on the walls that keep it from falling into the ubiquitous reclaimed-everything trap we see so much of. The stunning high ceilings have been stripped to reveal exposed timbers, with modern globe light fixtures and wall sconces keeping the space geometric and clean. The taps behind the long wood bar are backed with marble, too, which is one of the touches that makes the space feel more sophisticated than the average beer hall. There’s food, too, mostly in the form of housemade sausages and snacks. Morgan Hamm of Le Beau Market crafted the menu, which includes a breakfast-style pork sausage served with a fried egg, a lamb sausage, and even a vegetarian option made with squash and barley. There are also salads and a few snack bites like fries, pretzel bites, and fried pickles. Check out the menu right here. For now, they are open daily 6pm-1am, but plan to add lunch service soon. 582 Sutter St. at Mason, 415-361-5500. 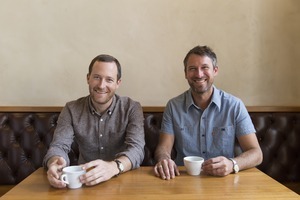 Justin and Jerad Morrison of Sightglass Coffee. Photo: Michael O’Neal. The Divisadero Corridor is about to have another icon of our local coffee roasting scene join the coffee klatsch: ~SIGHTGLASS COFFEE~ is going to be opening a café in the former KJ Produce Market on Divis at Page. I spoke with brothers Justin and Jerad Morrison, who just returned from a sourcing trip to Ethiopia, and they confirmed the news—they just secured the space a couple of months ago. They have actually been talking to the landowner for more than a year and are so excited to be opening one of their cafés so close to where they live (they both live nearby). Boor Bridges will continue to be their architect of record for this location, and it looks like they will have access to the space in early February—it’s currently being structurally upgraded. Realistically, we can hope to enjoy a shot of Owl’s Howl around the end of summer. Hoot! 301 Divisadero St. at Page. 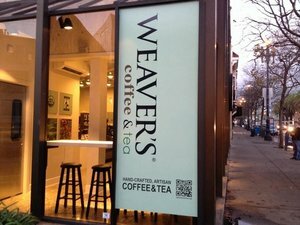 The exterior at Weaver’s. Yelp photo by Susie W.
Hoodline reports that the Castro has yet another spot for caffeination, ~WEAVER’S COFFEE &AMP; TEA~. It’s the second location from the San Rafael-based roaster John Weaver, who was a roaster at Peet’s before starting his own company. The glassy space is in the same building as Fitness SF and also has a patio out front that should be open in the spring. Hours are Mon-Thu 5am-12am, Fri 5am-11pm, Sat 5am-10pm, Sun 6am-9pm. 2301 Market St. at Noe, 800-328-1178. The interior of Lale. Yelp photo by Cherylynn N.
Hoodline reports that the former Villa Romana, which closed earlier this year after almost 60 years, has reopened as ~LALE~. The fabulously vintage space has been completely redone, sadly, and the result is rather generic, though reportedly the enclosed back patio has been revamped, which is nice. The owner is Suzan Sarikurt, who is looking to her Turkish heritage for inspiration. The menu offers breakfast dishes like omelets and eggs Benedicts, as well as Turkish-inspired lunch options including wraps and flatbreads. They are also doing a lot of baking in-house, with many daily specials on offer. Recently, housemade English muffins and jam were on the menu. Hours are 8am-3pm daily; dinner service should be coming soon. 731 Irving St. at 9th Ave., 415-566-8814. David Lawrence and Monetta White of ~1300 ON FILLMORE~ have a new project in the works, according to ABC license activity. Scoop reports that details are slim (there’s not even a name yet), but that a barbecue project is rumored (considering the name on file is Black Bark, it makes me hope for some brisket). We do know that the location is across the street from 1300 on Fillmore, and they hope to open in April. 1325 Fillmore St. at Ellis. As reported last month, the Tenderloin’s ~BURMESE KITCHEN~ had to close after a landlord dispute. In an interesting turn of events, it looks like Burmese Kitchen will now be opening in the former To Hyang space, which closed earlier this year, also due to landlord issues. The Burmese Kitchen website calls the move a temporary pop-up, but they’ve also applied for a liquor license, which seems to suggest a more permanent situation. 3815 Geary Blvd. at 2nd Ave.
Here’s some very unfortunate news: it seems that the Fire Department had to pay a visit to ~TBD~ twice last Thursday. Eater reports that their fire suppression system went off during a corporate holiday party around 7pm in the evening, spraying the kitchen with foam and setting off lots of alarms. The Fire Department came and gave them the all clear, though they did have to send all the guests home. Then, around 1am, employees at AQ saw smoke coming from the building. It looks like there was a fire between TBD and neighboring De La Paz Coffee Roasters, and both buildings sustained significant fire and water damage. TBD is closed until further notice, though they hope the repairs will only take a week (though it’s a big week, with holiday parties and festivities). De La Paz is also closed, but will be roasting at Four Barrel in the meantime, so there shouldn’t be any issues with their bean distribution. 1077 Mission St. at 7th St., 415-431-1826. This one just came through just in time for inclusion today, and it’s an inspiring one. ~HULI HULI HAWAIIAN GRILL~ is opening in Bayview early next year. The project is run by Project Bayview, a residential ministry committed to helping people in the neighborhood stay on track and building community within the neighborhood. Director Shawn Sanchez, who hails from Bayview, says they wanted to fund the ministry’s projects through work, so the idea for the restaurant was born. They’ve been working on the back garden of their building (it’s more than 100 years old), as well as the interior, and plan to open in February 2015. The food is Hawaiian-style barbecue, using high-quality meats and produce. They’ll also be offering healthful vegetarian options, including a kale salad. To keep everything accessible, they’ll keep menu prices around $8. Sanchez said that though they do have a good story, they want to be known first for their excellent food and inclusive atmosphere, and the story is secondary. We’ll be sure to keep you updated on this project’s opening! 4100 3rd St. at Hudson. 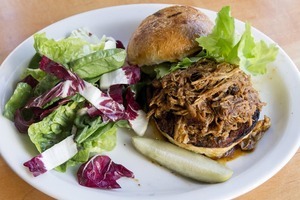 The pulled pork sandwich on farmerbrown’s new lunch menu. Photo from Facebook. 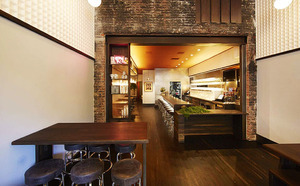 ~FARMERBROWN~ is now open for weekday lunch, Monday through Friday from 11am-2:30pm. It’s really nice to see them get some daytime action, after holding down that corner for so many years. On the menu, you’ll find their seasonal soul food, including the famed fried chicken and waffles, and salads and sandwiches including a pulled pork sandwich and a burger. This also means that the bar will be open all day, beginning at 11am until closing, serving drinks and snacks like barbecue chips, pickled okra, and spiced nuts. In April, they plan to add weekday breakfast, too—score! 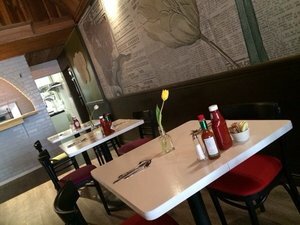 Looking for a good brunch spot for groups? ~THE HALL~ is now serving brunch on Saturdays and Sundays from 10am-2pm. All the vendors have special brunch menus on offer, with dishes like baked Moroccan French toast, a goat cheese and egg tagine, and classic eggs Benedict. They’ve also got bottomless mimosas, micheladas, and shandies for $10.28, and live music. Fun! 1028 Market St. at 6th St., 415-558-8293. ~RAMEN SHOP~ is now open on Tuesdays from 5pm-10:30pm, which means they can now take care of your noodle-slurping needs seven days a week. Things really are changing around here. ~MISSION CHINESE FOOD~ is now accepting reservations, according to a tweet.